We had an amazing stay at The Springs Resort and Spa in Costa Rica! Our room was spacious, and had a private terrace. The marbled bathroom featured a fabulous jacuzzi tub. Check out the video below for a short look at our time here - including a four-wheel adventure in the rain! I am SO excited to share pictures and video of my travels through Costa Rica. What an amazing experience. So much to share, I am breaking it down into several different blog posts. Our travel to Costa Rica was to do some photoshoots for Bounce Curl and Skintasy. Of course, even though we were there for business, there was still time for adventure!! I hope you enjoy this first blog post about Costa Rica and our time at the La Fortuna Hotel. Here is a short video with a tour of our accommodations at La Fortuna Hotel. I think you will agree that they were unique! And here is a gallery of pictures from our time at this hotel. Simply click to move to the next picture! STAY TUNED! - I will be posting more pictures and video from my trip next week!! In March 2016, I traveled to Dubai in the United Arab Emirates with my cousin. Round trip airfare was about $1000 for each of us. We stayed at the JW Marriott for the first few days, and then had the pleasure of staying with family. Dubai has been described as a playground for millionaires. This is, after all, a city known for Ferrari rentals and which recently passed laws to outlaw wild and exotic animals as pets (think lion cubs, cheetahs, and crocodiles!). Despite this reputation as being an expensive city for tourists, I can tell you that is just not true. Shopping is a favorite pastime in Dubai.... some amazing malls and shops! Before oil was discovered 50 years ago, Dubai was little more than a small fishing village. Today’s vibrant metropolis offers a wide range of experiences and we enjoyed several of them! Desert safaris have become one of the most popular activities in Dubai. There are literally hundreds of desert safari tours available and it can be tough to choose! Our Arabian Dessert Tour and Dinner Safari gave us the “full experience” of being in a desert camp. We were driven out into the desert (you will be amazed at how close the desert actually is to the city!) and spent some time playing with and riding camels, and driving desert buggies through the sand dunes. I was struck by how different the desert of Dubai is from the desert I know in Arizona; the sand seems much more “pure”. We enjoyed our meal and tea while sitting on the floor, being totally entertained by amazing demonstrations of belly-dancing. By evening, we were back in the city and ready for the next day’s adventure. Our next tour was in a helicopter to get a birds-eye view of the city. It was the best way to see some of Dubai’s iconic buildings and to really understand the interesting way the area is laid out…. Just off the coast of Dubai is an artificial archipelago (chain of islands) known as “the World” or “the World Islands” that extends into the Persian Gulf. We had a very unique view of it all from the air! Then it was on to…shopping! What a great way to see the landscape and Dubai and how the city connects to the man-made islands that extend into the Persian Gulf. This has to be the most unique layout of land in the world! Our helicopter tour was incredible! Swimming with the sharks..... YIKES!! Dubai is widely considered to be a global shopping destination with varied malls that offer a wide range of shopping experiences. So, as part of our sight-seeing, we did some good old-fashioned mall shopping! In Dubai the word for shopping is “souk” – you will see Gold Souk, Spice Souk, Perfume Souk and so on. Honestly, their shopping malls look very much like American malls, except for the Arabic writing everywhere. 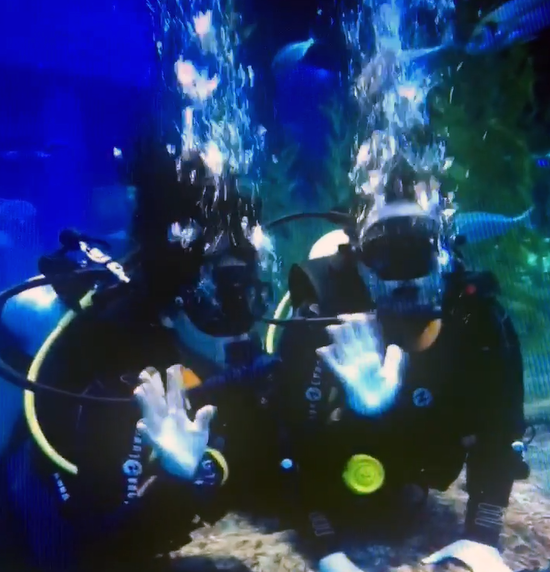 While in the Dubai Mall, we did the Shark Dive! It seemed very crazy and was really, really fun! I suspect they would never allow anything like this in the U.S. since our training consisted of only 15 minutes of basic instruction before they sent us down into the shark pool. It was the “real deal” of scuba diving, using the scuba tank and everything, and I have to say that at times my head felt like it was going to explode. That was a minor inconvenience – we survived, and it was an unforgettable experience!! I would definitely recommend a trip to Dubai; there is a wide range of experiences, and opportunities no matter what your budget. This website Visit Dubai is an in-depth resource for everything you will need for your trip: planning, getting around, what to see, where to shop and more! Check it out! In February, 2017, my best friend and I spent two weeks visiting Greece. Now, two weeks is a bit of a long trip to me; it’s difficult for me to be unplugged from my life for that long! But, we had an amazing trip and found a wide range of activities and beautiful scenery to fill each day. We purchased round-trip airline tickets (from AZ) through kayak.com for roughly $1000 each. The first week of the trip was spent in and around Athens. One of the big items on my wish list for touring was the Acropolis (I was not disappointed!). My original interest in Athens was because my parents lived there for about six years when they were younger; I wanted to see where they lived and visit the church they used to attend. I was not satisfied with the hotel we stayed in while in Athens (I recommend using any kind of travel tools to read and learn from traveler reviews to limit the chances for disappointment). It was rather run-down and not what I expected. But, I was most disappointed in the appearance of Athens itself. We chose to stay in the downtown area, expecting to see beautiful buildings. Well, the buildings WERE beautiful, but they were covered with graffiti. I really didn’t expect that. During our week in Athens, we visited the Acropolis (that was a highlight for me!) and the Plaka (for shopping and eating!). The Plaka, known as the “Neighborhood of the Gods”, is filled with bars, restaurants, and shopping areas. Now, Greek food is not like the Greek food you would find in the States. Traditional Greek food is characterized by high quality ingredients, fresh herbs and closely guarded family secrets. Stateside iterations may lean towards convenience and balancing cost/quality. I encountered lots of middle eastern people in Athens speaking Arabic, so I felt like I really fit in! Riding ponies while touring one of the three islands during our trip to Athens. We got a little queasy on the boat ride, but it was definitely worth it! Our next Athens adventure was to take Hydra, Poros and Egina Day Cruise. The cruise company did a great job of explaining what we would find on each of the islands we visited. It was very windy as we started out on the boat towards the first island stop. Within just a few minutes, my friend started to look really queasy and….well,… she started to throw up. Not being maybe the “best” friend I could be, I was giving her a hard time, and making fun of her a bit. Well, as karma would have it, my own time to get super sick began only a few minutes later. I’ve wondered if the summertime would provide for smoother sailing (it certainly would be warmer weather!) We recovered enough to really enjoy our time on each of the islands. We rode on ponies, stopped in ice cream shops and got to visit and learn about some very beautiful churches. I was really taken with the church visits. They are super-detailed and very godly, just quite amazing. Enjoying three days at Santorini overlooking the Aegean Sea! What a glorious view! After our week in Athens, we googled flights to Santorini (one of the Cyclades islands in the Aegean Sea about 120 miles south of the Greek mainland). By looking at hotels.com, we were able to find some of the least expensive hotels with the nicest views. We settled on Aqua Luxury Suites for roughly $200/night. The views were absolutely stunning! We spent three days here and just really had a blast. The area was charming, with old cobblestone streets and since we were there in February, it really wasn’t crowded at all. Local told us that the area is quite busy in summertime. Everyone kept warning us to be alert and on guard because stealing from tourists can be quite common there. We had no problems at all. A review would not be complete without further comment about the food! We did take along some enzyme/antacid pills (which is never a bad idea when you are traveling to areas where the food is different than what you usually enjoy in your day-to-day). We did experience a little bit of upset stomach with the different foods, but nothing severe enough to keep us from trying and enjoying this new cuisine! There was very little processed food; everything was fresh. Actually, even though I am lactose intolerant, I enjoyed drinking milk on the trip and didn’t experience any of the usual discomfort I get in the U.S. Although I am not a big “fish eater” – when you are eating oceanside, you just have to try the local delicacies! There were real cool-looking fish that were deep fried (and you could see the eyes and everything!). I have to say the seafood was really, really good. I even enjoyed eating octopus! It is absolutely normal to see octopuses hanging outside of the local restaurants. This reminded me of some of the traditions in my house growing up. My parents definitely adopted some of the Greek culture for sure! With every meal, the Greeks provide uzo – a “black licorice-type” whiskey that is enjoyed before and after every meal. This is the same beverage that my parents have been drinking their entire lives. It was an absolutely amazing trip!